sunshapers has been created to help every woman feel good in the sun. ‘I hope that every woman will be able to look forward to a holiday where they can relax, tan safely and look in the mirror at a healthy-looking body that they love a little more’. 'Massage sunscreen deep into the skin. Your massage can help break down fat cells'. True! 'Use sun cream with a tan accelerator. The quicker you build a base, the deeper your tan can be at the end of your holiday'. ‘Moisturise your body inside and outside in the sun. Drink plenty of water and snack on sun-friendly, juicy fruits’. 'Experiment with contouring! Try a contour from chest to navel. It can give lovely slimming definition.' Have fun with it! – sunshapers penetrates to the deeper skin level where fat cells exist. the blood stream as energy. When that fat is released, the size of fat cells is reduced. (sunshapers breaks down fats by +60%). – sunshapers inhibits the formation of new fat cells (by up to 80%) and lipid uptake (which grows the size of fat cells). This reduces the appearance of cellulite in future. – Within 28 days, there is visible body-contouring and smoother-looking skin. 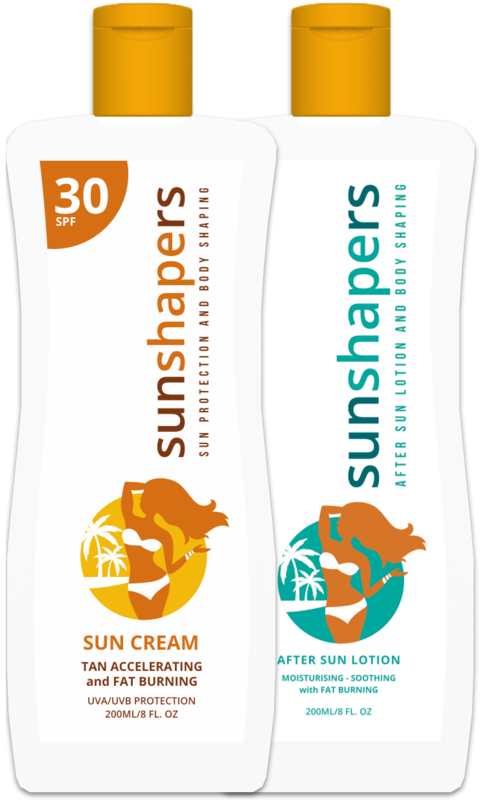 – Use sunshapers SPF30 followed by sunshapers After Sun lotion during your holiday. When you return home, keep using sunshapers After Sun Cream to moisturise, renew cells and to keep the sunshapers process working. If it takes 28 days, why use in the sun? (the breakdown of fats and lipids within the fat cells). sunshapers® 2018. All rights reserved.